Got the score 17157 in A-Type (emulated). Got the score 20578 in A-Type (emulated). Got the score 19621 in A-Type (emulated). Got the score 47796 in A-Type. Jeppe and Peter bought an NES for me!!! Best gift since I got an Amiga as a teenager. 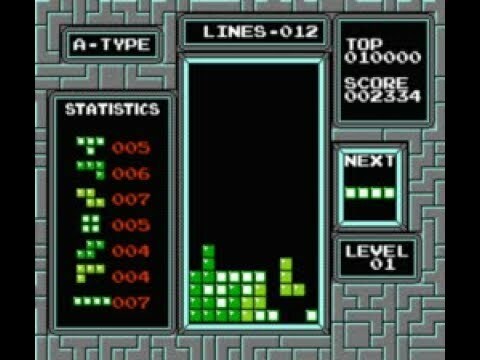 :) And then I played my best Tetris game so far. Got the score 54282 in A-Type. Got the score 49483 in A-Type. I'm pretty consistent in getting around 50k points. Great game. Love the cute end game screen with the rocket launching. Got the score 67011 in A-Type. I reached level 10, where the game basically just tries to murder you. Got the score 57051 in A-Type. Got the score 69854 in A-Type. Got the score 64595 in A-Type (emulated). I recorded getting my third best score ever, but didn't get any audio for some reason.